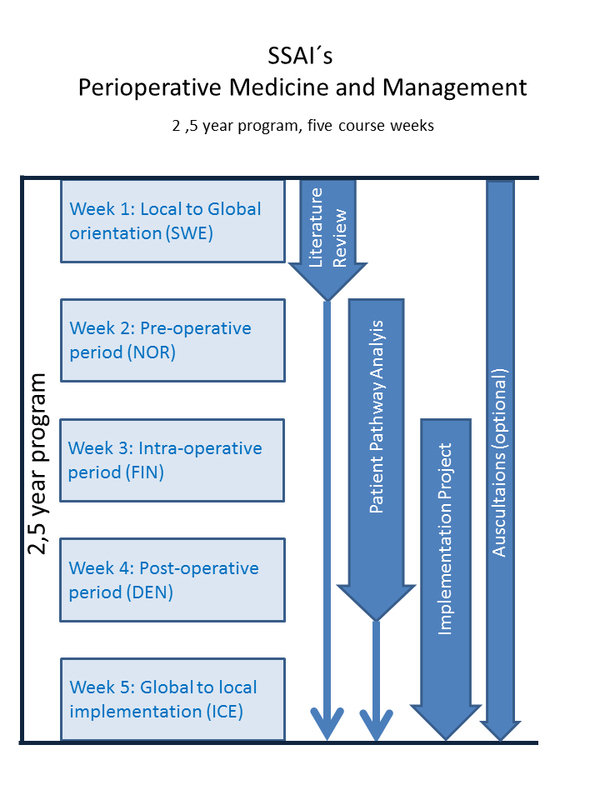 The Scandinavian Society of Anesthesiology and Intensive Care Medicine (SSAI) co-ordinates an Inter-Nordic post-specialist training program in Perioperative Medicine and Management. The first course started in Stockholm, Sweden, November 2014 with 18 participants. The second program started in 2017 and the third program is open for applications with a deadline 31st March 2019. A maximum of 24 participants can be accepted and a decision on acceptation will be announced in April 2019. The aim of the program is to provide anesthesiologists that are especially interested in perioperative medicine and management, and involved in the planning and administration of the perioperative process, with new ideas of how to run and develop their organization and the tools to implement changes. The program will focus on certain areas within “perioperative medicine”, however knowledge in more basic and very detailed medicine will not be included as participants are already specialists and there are other programs available within SSAI that aim for advanced knowledge in specialized anesthesia. The main emphasis will be on methods of how to organize perioperative care to improve patient safety, satisfaction and quality of life, while utilizing resources in the most economical manner. The program will not cover general management issues, mostly relevant for heads of departments, as such courses are available elsewhere. The program will create a Scandinavian network in perioperative medicine and management that will promote not only collaboration between participants but strengthen the position of perioperative care in the Scandinavian countries. Peri-operative medicine. How knowledge and implementation can improve patient safety and outcome through multiprofessional teamwork in the pre-, intra- and postoperative period. Peri-operative management. How coordination of the perioperative process can improve quality, productivity and cost effectiveness. The program runs for 2 years. During the training period, 5 courses – each lasting 5 days – will be arranged. The courses will circulate among the Nordic countries (Sweden, Norway, Finland, Denmark and Iceland). The program language is English. The minimum total time away from clinical work will be ten weeks. Five weeks (at the home clinic) will be set off for assignments such as A) a literature review in perioperative medicine, B) a patient pathway analysis, C) a project in managing implementation of change. Furthermore, five week-long courses, in the five Scandinavian countries. The literature review, the patient pathway analysis and the implementation of change should be linked around the same clinical problem – as a logical step to solve problems, 1) acquiring knowledge, 2) analyze problems in processes and 3) implementing changes to improve them. We welcome applications from anesthesiologists with special interest in perioperative medicine and operating room management. Since the program aims to move the participants forward in personal leadership as well as in skills in management, personal commitment and enthusiasm is required to succeed and to make the program as useful as possible. Membership in SSAI is mandatory and proof of membership has to be attached with the application. If this is not done before deadline of application, the application will not be handled. All expenses for this program (including travelling, accommodation and a fee for the whole program) have to be covered by the host clinic. The program fee for all 5 courses 10 000 Euros (over 2 years), not including travel and accommodation costs. The following documents (except the photo) should be scanned into one document in the mentioned order and mailed to ssaispomm@gmail.com no later than March 31st, 2019. Make sure your name appears on all documents/ files and in the title of your mail. We are looking forward to receiving your application! For further information about this program please contact your national representatives in the Steering Committee.